Preissler Media Services is one of Northern Los Angeles / California Gold Coasts most knowledgeable and experienced graphic,multi-media computer consultants. We specialize on all computer platforms and particularly like Apple. In addition, we have an advanced multi-media development and authoring studio. Preissler Media Services is devoted to help problem solve and consult the exact computer / software needs for any individual or organization. We provide maintanance, archival back-up software solutions for most all businesses and professional practices. Our multi-media development and authoring studio creates artistic multi-media experiences, such as: cutting edge graphics, databases, digital signage, kiosks, photography, videos and websites, to brand your company message, products and services. We achieve maximum exposure to increase sales, traffic and enhance your organization message. In addition, we provide remastering and restoration services for old / new film, digital images, videos, pictures and documents. Last, we provide all forms of traditional print media such as: brochures, pamphlets, posters, and signs. With our knowledge and expertise to produce many great solutions and services, Preissler Media Services is your one stop location for all your computer business and marketing needs. 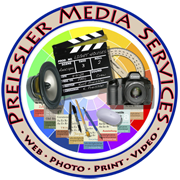 Preissler Media Services is located in beautiful coastal mid-town Ventura. The cross streets are Thompson Boulevard and Seaward Avenue. We are exactly 7 blocks west of this junction; or 5 blocks east of the junction of Sanjon Road and Thompson Blvd. For a better visual go to our "Map to Our Store." 8:00 a.m. to 5:30 p.m. (Please, No Walk-ins, By Appointment Only). and Other Earth Friendly Products.